Black Shelton’s new restaurant, live music venue and retail space, Ole Red Tishomingo, will celebrate its grand opening with an Opry-style performance and block party on Saturday, September 30th in Tishomingo, Oklahoma. The themed entertainment venue was inspired by Shelton’s “Ol’ Red,” one of the superstar’s earliest career-defining songs. 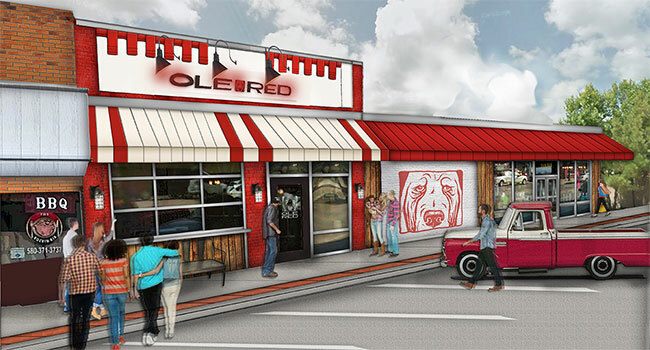 Operated by Ryman Hospitality Properties, Ole Red Tishomingo will open its doors with the party flowing into the streets as an outdoor stage plays host to performances by RaeLynn and Opry members Jeannie Seely, John Conlee, and Ronnie Milsap. Shelton will co-host the Saturday, September 30th show with 650 AM WSM’s Bill Cody. The free Blake & Friends concert will begin at 7 pm Central and will be livestreamed on Ole Red’s Facebook page. For some, the grand opening festivities will begin on Friday, September 29th at 8 pm when Shelton will perform an intimate, private concert from the Ole Red Tishomingo stage. Proceeds from the performance will benefit the non-profit J.C. Reaching Out, a local charity that provides financial assistance to family members of people battling cancer. Just 130 tickets will be sold at $200 apiece and will be available on olered.com beginning Wednesday, September 6th at 10 am Central. Fans can also enter the national “Road To Tishomingo” Sweepstakes where they will have a chance to win a flyaway for two, including air travel to and from Dallas, accommodations at the Gaylord Texan Resort, ground transportation to Tishomingo, and VIP admission to the free grand opening concert. Regional stations in Texas and Oklahoma will give locals the chance to participate in the “Road To Tishomingo” with an opportunity to win ground transportation to the grand opening event on September 30th. Winners will caravan on specially wrapped buses for the day trip. Participating stations include KPLX/99.5 The Wolf (Dallas), New Country 96.3 KSCS (Dallas), Jake FM (Oklahoma City), 101.9 The Twister (Oklahoma City), K95.5 Tulsa’s New Country Leader (Tulsa), and Today’s Country Variety 98.5 K-V-O-O (Tulsa).